If the idea of splashing around in steaming hot water in the snow-covered mountains of Italy's Val d'Aosta region takes your fancy, you're going to love Pré-Saint-Didier: a spectacular high altitude spa in which to while away the hours relaxing in the in and outdoor hydromassage pools, bathing in mineral-rich thermal water and sweating out the toxins in the alpine saunas. The tiny town of Pré-Saint-Didier lies North of the confluence of the Verney torrent and the Dora Baltea river and just minutes away from the famous ski resorts of Courmayeur and La Thiule. Ever since the 17th century, when the first tourists came here to "take the waters", Pré-Saint-Didier has been attracting a steady stream of visitors from all over Europe. 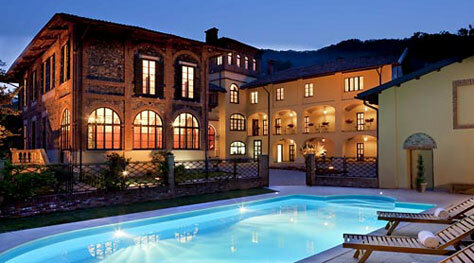 No more so than during the late 19th century, when the spa was built and the town became one of the favorite retreats of Italy's Royal family. Although the thermal station suffered a brief period of post war decline, in recent years it has enjoyed a new surge of popularity, so much so that TripAdvisor included the resort in its 2011 list of top European destinations. 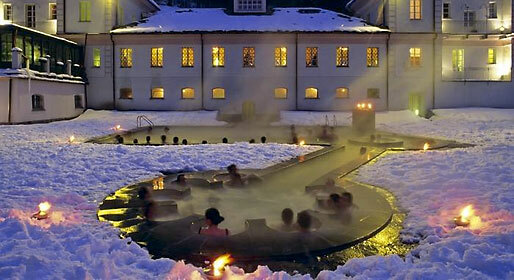 The spa's three outdoor thermal baths are a major attraction, especially in the winter when the surrounding gardens are carpeted with a thick layer of snow. 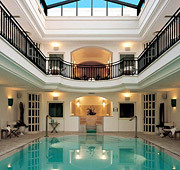 The first two pools are linked by an aquatic path and equipped with hydromassage jets. Recent restoration work has conserved the spa's original 19th century structure whilst allowing for the addition of a brand new, three floor wellness center realized almost entirely in local stone and wood. A chalet in the garden and a panoramic mountain refuge provide the enchanting setting for the Pré-Saint-Didier's saunas, relaxation areas and massage rooms. Each Friday evening, at 19.00, the spa hosts a 100% organic aperitif, using products grown in the Grassoney valley, and high altitude wines to match. On Fridays, Saturdays and public holidays, the baths stay open until 23.00: the perfect occasion to enjoy some romantic, starlit relaxation. Spa lovers will want to try one of the "Master of Wellbeing"'s specific treatments, such as the sensational "Sauna Cream", which combines the properties of steam and cream to leave the skin velvety soft! Opening hours: Monday to Thursday: 09.30 - 21.00, Friday and Saturday: 08.30 - 23.00, Sunday: 08.30 - 21.00. Life's too short to queue! Purchase your entrance ticket to the spa in advance, on the Terme di Prè website!